Gianfranco Brancatelli entered three grand prix in 1979 but failed to qualify for any of them. 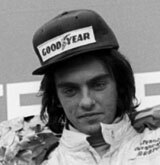 He had shown promise in the junior categories but, if anything, damaged his career chances by taking up the opportunities to drive for back-marker teams Kauhsen and Merzario in F1. He later moved to touring cars where he enjoyed more success.